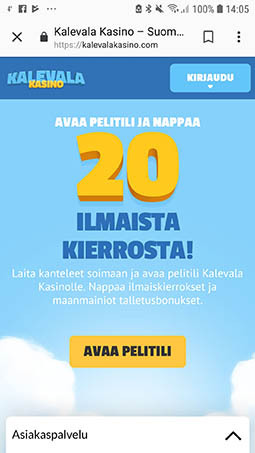 Kalevala is the sister casino to Lucky Dino and Casino JEFE (both accredited), but available and dedicated only to the Finnish players. This casino is licensed in Malta and powered by Microgaming (Quickfire version – no download), NetEnt, SGI, Play n Go, Big Time Gaming, Thunderkick, Yggdrasil, Barcrest, Scientific Games, Red Tiger and Pragmatic Play, with big focus on Play n GO’s games, whose new slots this group of casinos gets among first. They’re offering international lotteries too, like EuroJackpot, Mega Millions, EuroMillions and PowerBall. Kalevala Kasino has an amazing assortment of mobile games – Microgaming, NetNent, Play ‘n Go, Scientific Games, Yggrasil, and Barcrest. Over 300 are available to play. Kalevala Kasino Terms and conditions Apply. If this is run anything like Casino Jefe – I don’t see any problems here at all. Fast payouts – no reverse time – no withdrawal limits – it’s a very player friendly casino – I mean, Kasino lol.